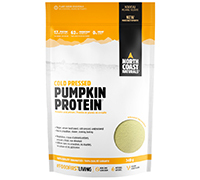 Cold Pressed Pumpkin Protein is a highly digestible non-GMO vegan protein. Our 100% pure protein has nothing added. It provides an impressive 17 g of complete protein per serving, is high in fibre and is naturally free of gluten, sugar, sweeteners and flavours. Each serving provides 62% (260 mg) of the daily value (DV) for magnesium, 34% (3.7 mg) for zinc and 28% (5 mg) for iron. Our pumpkin protein is a wholefood-based option for those looking for a highly digestible, gluten-free and low-allergenicvegan protein. It delivers all the essential and branched-chain amino acids, making it a complete protein. Mineral deficiencies are commonplace, and our pumpkin protein is naturally rich in three essential minerals (magnesium, zinc and iron) while also providing potassium. Magnesium, in particular, is among the most beneficial minerals as it helps regulate over 300 processes in our bodies,including muscle and nerve function. Pumpkin protein also delivers a cleaner taste than many other vegan proteins—it works especially well in smoothies and shakes. Pumpkin protein is a great alternative to hemp or rice proteins, which have been around for years. Try our new pumpkin protein—we think you’ll be pleasantly surprised to find a new dietary friend.